Catherine Larose’s collared dresses resemble a ballerina’s gown and were inspired by the cosmos and the sirens of mythology. 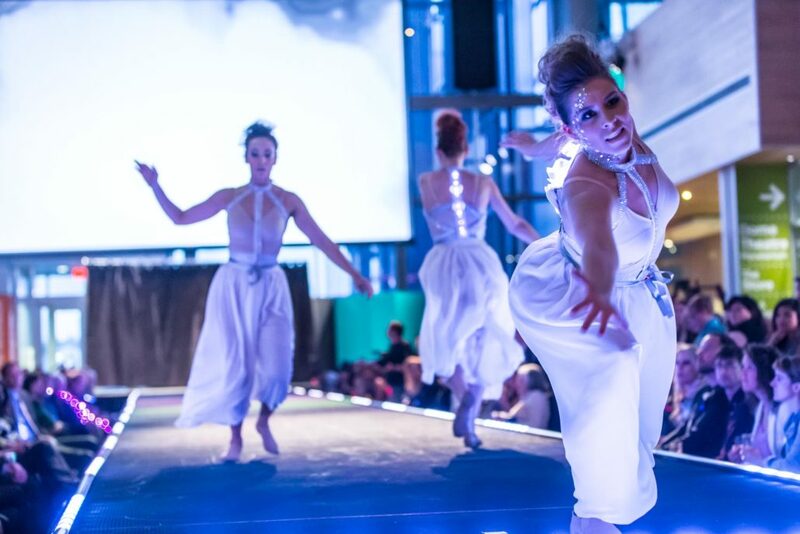 Lighting effects from the three costumes were achieved by using gesture sensors, pressure sensors, 3D printing, Xadow 2 microcontrollers, and sophisticated programming. That was then incorporated into the dance choreography Trip The Light Dance Company. As the dancers twist and bend their bodies the lights on the back of their costumes glow brighter making it a very mesmerizing, almost haunting, piece. Erina Kashihara’s “Geometrical cells” was inspired by human body cells and it’s represented by many polyhedron cells which have LED lights underneath and cover the body of the wearer. The two pieces interact with each other, when the wearers are close together, raising their arms up, the pieces start twinkling brightly. Once the connection is lost they go back to their solid colours. 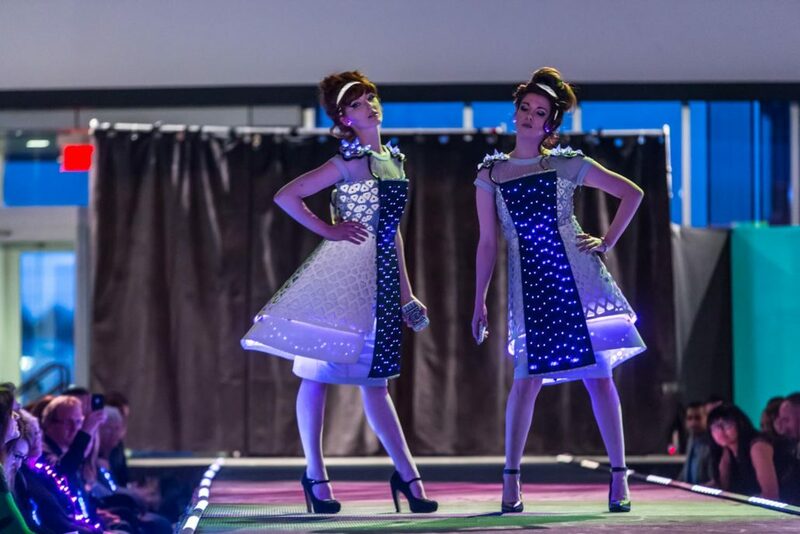 The two identical sleek dresses, designed by Phi:Illuminated, were created with laser cut reflective fabric, allowing the wearers to play arcade style video games off of the others dresses. The old school games are controlled by paired smartphones which are connected via bluetooth. Scores can be kept by light diffusing 3D printed shoulder crystals that light up and change colour. 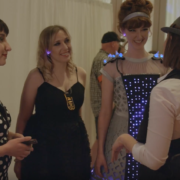 These retro dresses contain 510 total addressable LEDs! 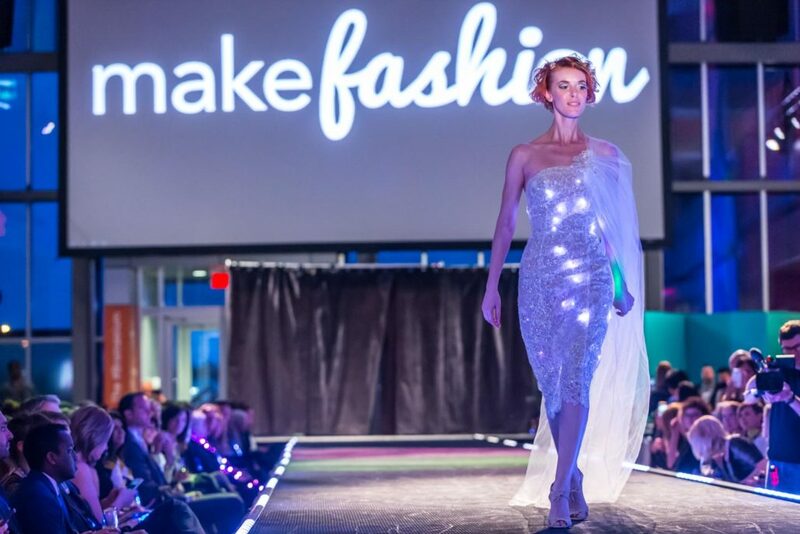 Virtually Vogue creates trend setting wedding gowns for brides who prefer their dress to light up. 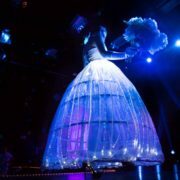 Wedding Dress 6.0 is a beautiful glass like gown that can be programmed to display beautiful and dramatic effects. 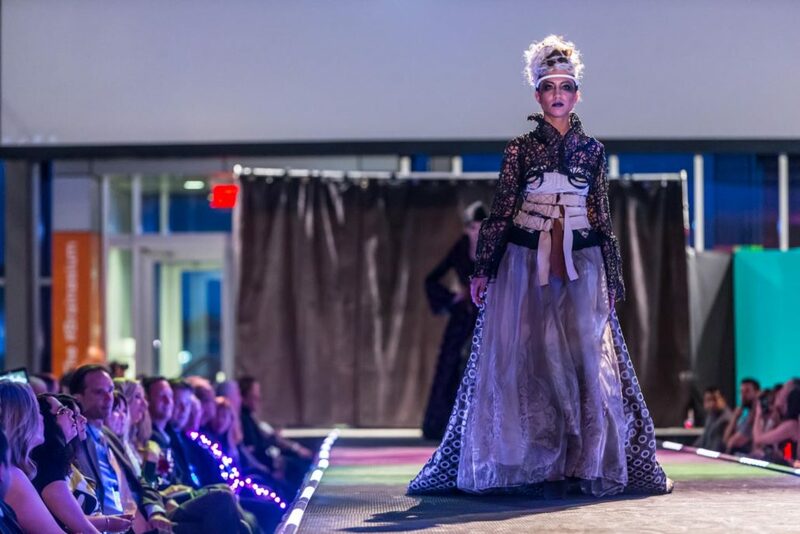 The gown is embedded with built in heat rate sensors, pressure sensors, Xadow 2 microcontrollers hundreds of LEDS and advanced programming that enable the bride to control the special effects at any moment. 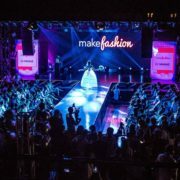 To:gether takes neocouture clothing and finds ways to have the design and shape respond to the wearer. It’s an exploration of brain computer interfaces and how technology can transform how we communicate. The two looks, designed by Kathryn Blair and Miss Velvet Cream, show interplay between the brainwaves of the wearers and show similarities and differences in their thinking by movement silhouette and light so you can literally see how similar two people are thinking.The muse headsets gather the EEG data about each of the people wearing the garments, which they relay to the Rephone microcontrollers via Bluetooth. The microcontrollers compare the data over wifi, and control the motion and lights of the outfits. The more similar the wearers are thinking the more the motions and lights of each dress make the outfits look similar. 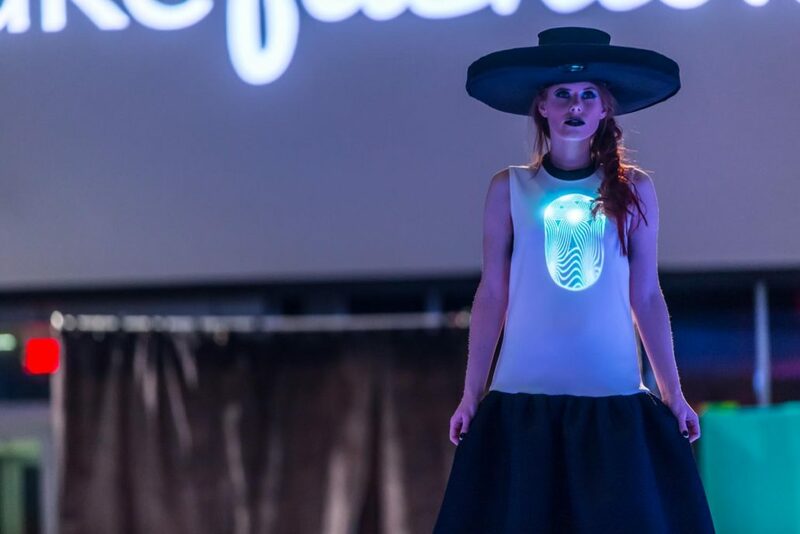 Lumen Couture is a self contained projector concealed in a hat. From inside the hat the projector shines down on the front of the model displaying a light and sound show. 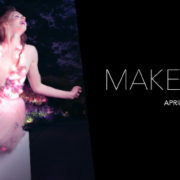 The dress, created by Chelsea Klukas and Chris Corner, went through three concept stages before finding the winning look. The projector was stripped down to remove extra materials to keep the wide brim hat as lightweight as possible. The heaviest element, the battery pack, was counterweighted at the back of the head. 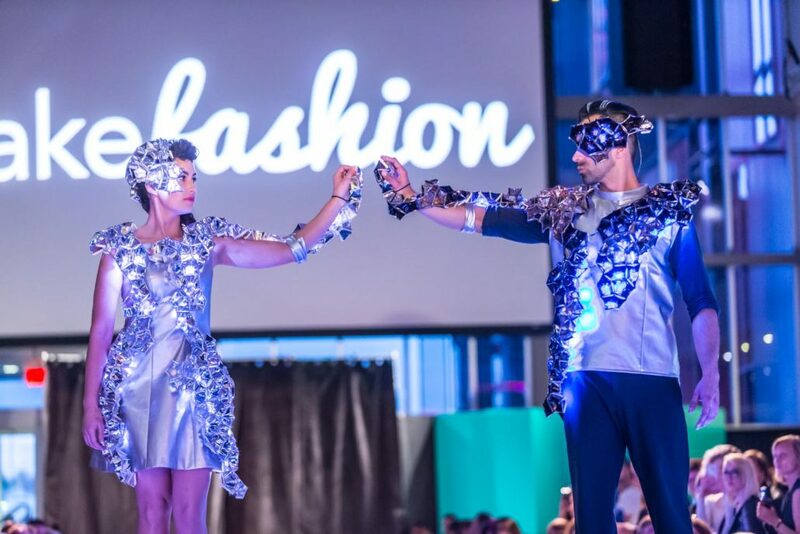 We’re looking forward to creating some more pieces that push the boundaries of what wearable technology can do! We’ve recapped some of the amazing moments of the 2016 Gala in this video, check it out!